Mama is visiting! Exciting times around here. Not only do I get to spend time with her, I also get home cooked Lebanese food! Mama had me at the ripe young age of 20, back in Lebanon. She then immigrated to Canada with me and my younger sister when I was 8 years old. Despite the hardships she endured day in and day out as a young single Lebanese mom trying to navigate her way through a new country with two small children in tow, she never failed us. She was our rock, our pillar of strength and still is today even though we’re all grown up. I sometimes wonder how she did it, and at such a young age. She raised us on her own, without the village it takes to raise children, all while she was growing up herself, and still managed to give us a better life than we could have ever hoped for. I guess we all find the strength we need to survive, but if I could be half the woman, mama and teta (grandmother) she is, I would be satisfied. Being across the pond (in Italy), thousands of miles away from her, my sister and my niece is not easy, but we stay close and in touch thanks to technology. Even though an ocean separates us, love and Skype, unite us. Yes I know, we’re cheesy and all about the PDA in my family. Thankfully hubby is in to it, otherwise we might have chased him away by now. Besides being an amazing caregiver, Mama is a great cook. She learned the tricks of the trade by observing those around her as a young girl and then trying things out on her own until she got it right. When she moved to Canada, she mostly worked in restaurants where she also observed and picked up recipe ideas she would come home and make for us from time to time, but she never abandoned her traditional Lebanese recipes, which we grew up loving and asking for, even to this day. As I learned to cook, there were some things that I just never bothered to make myself, preferring to ask Mama for it. She is the expert after all and was always ready and willing to whip up a meal for her “banet” (girls). Now that I’m living far away, I no longer have the luxury of enjoying her home cooked Lebanese food on a regular basis, so I’m trying to make it for myself, following her instructions. She never measures and while she does her best to dictate the recipe to me over Skype, it’s always a guessing game as to how much a bit, a handful, a pinch and a drop really are. Most of the time they turn out good, but not quite like hers. So, now that Mama’s here for a visit, I’m taking full advantage of it and we’ve taken to making some of my favourites together, so I can measure things out and document the process for the future. I’m also training Mama to measure so she can start doing so and document her recipes to share with the world. It’s just not fair for her to keep them all to herself. Luckily for me, Mama has veganized many Lebanese dishes for my benefit. Yet not all have needed adaptation as Lebanese cuisine is quite versatile and there are loads of naturally vegan dishes. 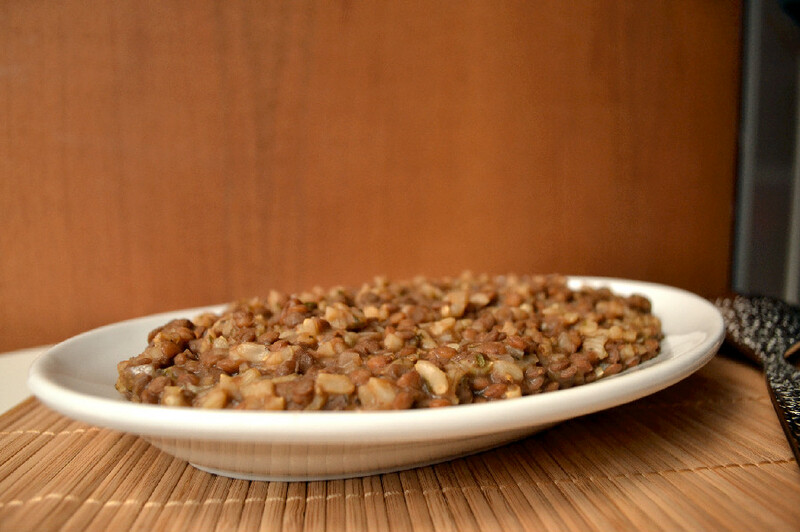 One of my favourites is Mujaddara, a delicious mix of brown lentils, rice and onions. In old times it was considered a peasant food, but let me tell you, it’s awesome and way better than it looks. 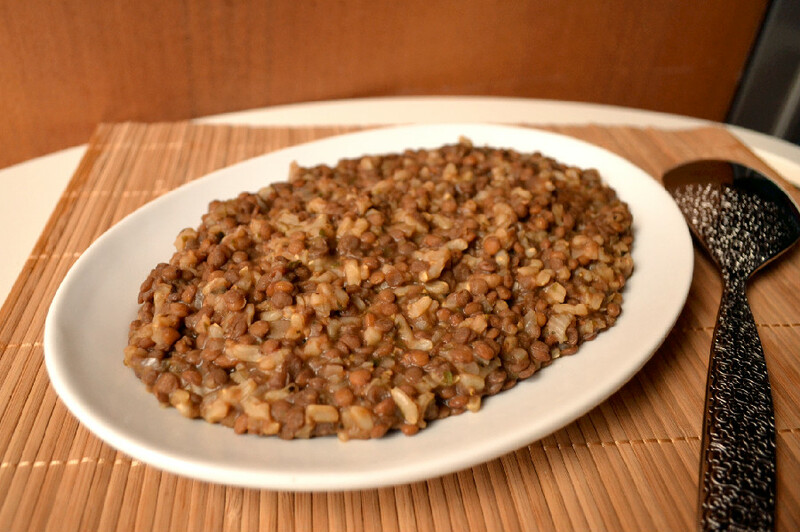 There are also many variations on the recipe, depending on the region and family, some make it with brown lentils, some with green, some add equal parts rice and lentils, others add more lentils or rice. Mama’s version is the one I know and love, a comfort food that brings back memories of childhood and Mama’s kitchen. While it is traditionally made with white rice, Mama adapted it for brown rice years ago when we gave up white starches in favour of whole grains. So this is the version I am going to share with you today. 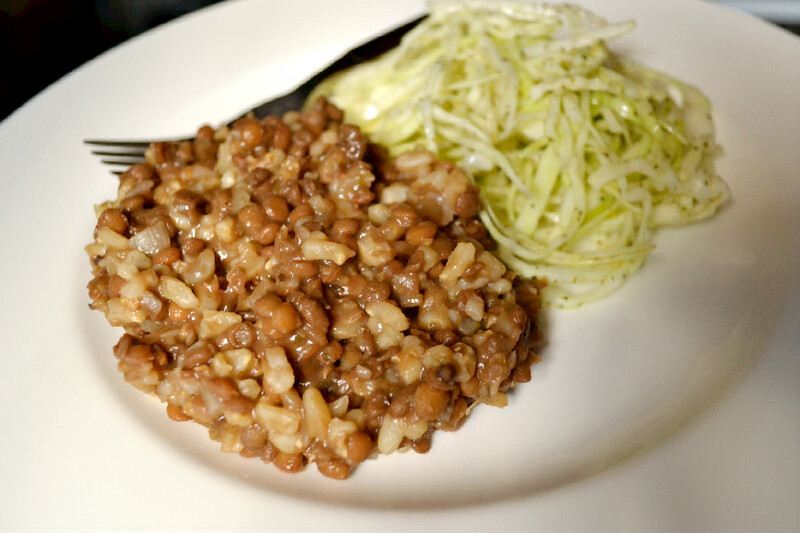 Its simple, delicious and nutritious and just happens to be vegan and macrobiotic friendly. 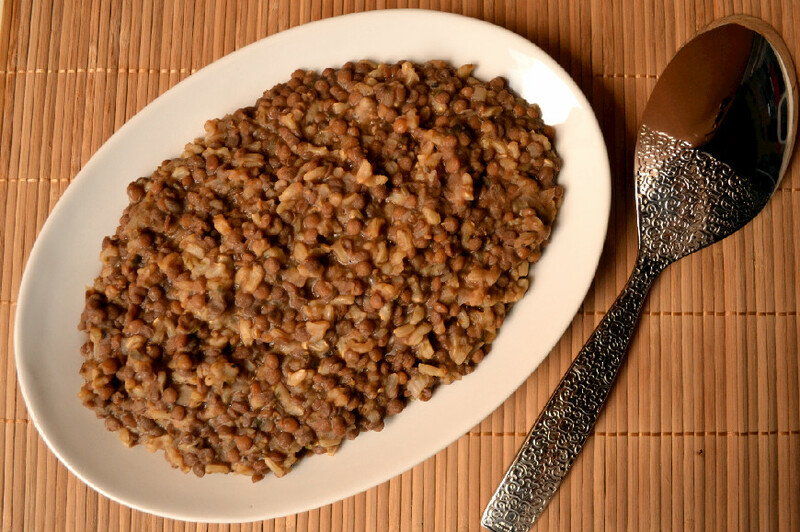 Mujaddara is best served warm (not hot) or at room temperature with a salad. My favourite accompaniment to Mujaddara is Mama’s Lebanese Minted Cabbage Salad (salatet malfouf). I’ll write that up and share it soon. Update: Follow the link for the recipe. This is how we ate it for lunch yesterday with warmed up flat bread. I can’t seem to find Lebanese pita bread very easily in Milan, so we settled on a store bought Farro flatbread which vaguely resembles Lebanese Saj bread. If you don’t know what that is, I encourage you read David Lebovitz’s post about it here. While we made enough Mujaddara to serve 3-4 people, I ate so much of it that we barely had any leftovers. Oh what hubby is missing out on. He doesn’t like legumes and won’t even try it. Add washed lentils and 3 1/2 cups of water to a pot and bring to a boil over high heat. Add another 1/2 cup of water, reduce heat to low, cover and simmer for about 35 minutes. Stir in rice, add another 1/2 cup of water, cover and simmer for another 35 minutes. Mixture should still be somewhat watery, lentils and rice should be soft but not mushy. Sauté onions over medium heat, with olive oil and salt, until translucent, about 5 minutes. 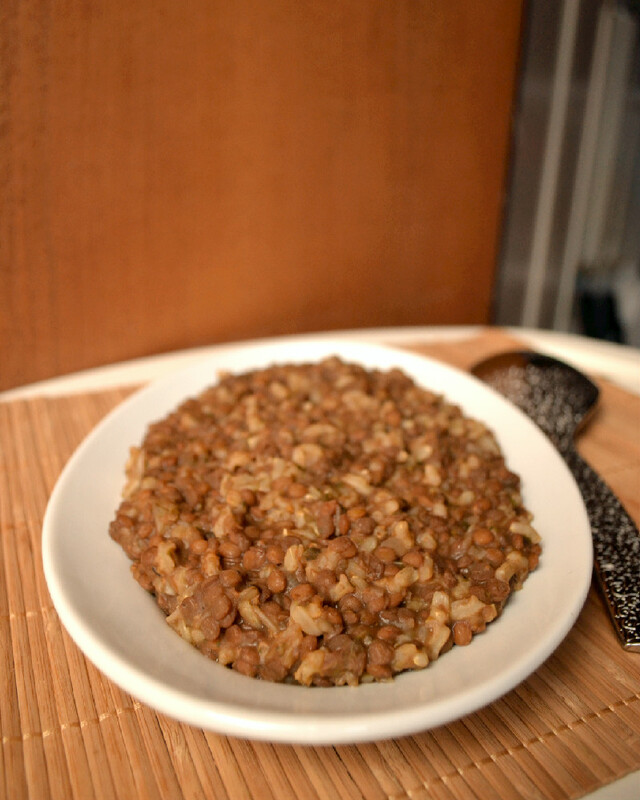 Add sauteed onions and oregano to lentils and rice and stir to combine. Simmer uncovered until all the water has been completely absorbed, about 10 minutes. Serve warm or at room temperature with a side salad. Note: Mujaddara can also be made with bulgur wheat, as Mama’s grandma used to make it. I will make and share that version another time.